If you have a space about 4 feet by 8 feet to spare on your patio, yard or near the back door in a planter you can grow and harvest delicious, healthy home grown vegetables without a lot of work and at low cost. Here's how we constructed a 4ft x 8ft raised garden bed that produced early greens like spinach plus many pounds of organic tomatoes and squash. When we bought our home in Vermont we had high hopes of expanding our passion for organic gardening. However, as we made our plans the first spring we realized we couldn't grow a garden without first clearing out some overgrown trees and improving the soil around the house. We love fresh organic vegetables and gardening, so we decided to build a raised bed kitchen garden so we could grow a few tomatoes, peppers, carrots and cucumbers.The raised bed we built turned out to be simple enough for a beginner to construct and easy to maintain. Here's the story of how we managed to grow a tiny garden with a big harvest by using a raised bed planter box a few steps from our kitchen door. For our first winter in Vermont we endured record snow storms. More than one time every week found me outdoors after a snowstorm, pulling heavy snowfall from the roof of our house.At one point the snow depth on the roof was close to 30 inches; the snow on the ground reached up to my hips. When the snow finally melted in the Spring we realized our yard and garden would need plenty of work. The clay soil was too heavy to successfully grow most flower and vegetable garden plants. Much of the yard had been shaded by huge pine trees for more than 50 years, so the soil was also high in acid. Previous owners hadn't done much gardening other than mowing what passed for a lawn around the home for 15 years. The pines had been dropping needles every spring on the lawn and roof for many years. The soil in our yard is a combination of wet clay and stones, and it's high in acid. That's great for growing pine trees but not so nourishing for flowers and veggies. We tackled our first year garden project head on in May 2011 with the help of local foresters. They climbed, de-limbed and cut down a dozen tall pines from around the house. We left smaller, healty pines and young hardwood trees and had all the branches chipped up in to mulch. The big tree trunks got trucked away to a local lumber mill to become pine boards and wood shavings.This selective sustainable timber harvest opened up our yard and wooded areas to much needed sunlight and air. After removing the overgrown pines we also thinned out the sapling hardwood trees. These first steps immediately made our home and yard brighter and the yard feels much larger now. The trees, our future gardens and we humans all have the right amount of space to breathe and grow in harmony. And we made sure to leave plenty of trees and brush for the wildlife who live on our property. I planted two crops in my small raised bed garden last fall after the huge tomato and squash harvest ended. In late September, on the left side of the box I planted organic garlic; on the right side I planted spinach seeds. Next I added three flexible hoops over the box, and placed plastic sheeting (heavy duty builders plastic) in a tent/greenhouse to shelter the side with the spinach ... then I crossed my fingers. In about a week the spinach sprouted, and it stayed quite small over the winter. Snowfall was light in Vermont this winter, so I had no problems with the little greenhouse collapsing. But it was cold, and I planted my seeds a bit later than I should have so the plants languished in the cold until late February. By March the weather was milder and I was able to harvest spinach for a delicious salad. I also planted peas in between the sprouting garlic plants on St. Patrick's Day. They sprouted by the end of the month. April brought even more warm weather and so I planted more spinach, radishes and lettuce under the plastic-sheeting-shielded side of the planter. First we marked off a 4' x 8' spot on flat ground that got plenty of sun close to the kitchen door. We dug up the soil in that area to aerate the clay and remove large stones. Then we cut 2x6 lumber into 4 4-foot pieces and 4 8-foot pieces and nailed then together to create two rectangular boxes. We stacked the boxes so we had a planter that was about 12 inches deep. We didn't line the bottom of the planter with wire fence or fox wire mesh, but if you have a problem with moles or gophers that's often a good idea. Next we needed to add soil and improve the drainage, so we added a layer of small stones to the bottom then dumped in a pickup truck load of local "moo doo" - a mixture of soil and well-aged odorless cow manure that we purchased from a local organic dairy farmer. Here's our tiny kitchen garden right after planting on Memorial Day 2011. We bought organic Roma Tomatoes and New England Bell Peppers at the local farmers market, plus I added a couple organic cucumber plants that I grew from seed. I'll plant marigolds, carrots and basil in the open spaces in a few weeks - watch for our small space garden progress pictures over the next few months. I'm 5'2" tall and if you look carefully you can see me peeking through the foliage between 2 of our tomato plants. The plant to the left is an organic Roma tomato variety. The center plant - the giant that will probably climb to the roof by summer's end - is an heirloom variety we're trying out. We're planning to dry most of our tomatoes; the heirloom variety (I can't recall the name - must ask the farm stand folks next weekend) was recommended by the grower as one that's a favorite for making dried tomatoes. Rain gardens are areas planted with native plants around a small depression in the lawn. They filter storm water runoff in your yard or along your driveway and help prevent flooding, pollution and damage. 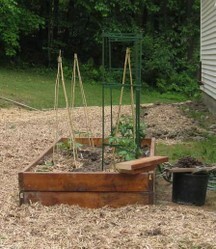 Go vertical and get more harvest from a small garden by growing vine vegetables up a trellis. The first yellow squash from the plant growing in our small space garden is almost ready to harvest. Look closely and you'll see my pollinator friends working on new squash blossoms in this early morning photo. A cucumber plant is growing just to the left of the squash and it yielded it's first fruit for my lunch yesterday. Our tomato plants are more than 7 feet tall now, and they're loaded with green tomatoes. The cucumber plant tucked into the front of the raised bed is also doing nicely - I've already eaten the first cuke. It's neighbor in the same corner is a yellow squash plant, and that's also been bearing lovely little squashes for my stir fry dinners. Now if I could just convince the tomatoes to begin to turn red ... maybe next week? Once our three tomato plants (2 Roma and 1 heritage variety, a pink Brandywine) started bearing red, ripe tomatoes we had a hard time keeping up with the harvest. We cooked, ate and gave away tomatoes at every opportunity. We've got tomato sauce (made with our tomatoes and zucchini we planted in another area of our yard) and dried tomatoes stocked into our freezer. We eat tomatoes every day, and we give tomatoes to anyone who visits. The weather is getting cooler and days are getting shorter. The Roma tomatoes are determinate, which means they only produce fruit for a specific time them the plants are done. The tomatoes don't want to stay on the vines until they're fully red this late in the season. They'll drop off at the slightest touch once they start to have a blush of pink on their skins. But they ripen beautifully in a bowl in just a few days; our kitchen table is covered with bowls of tomatoes in various stages of ripeness and every day I gather a big bowl of tomatoes from the plants. Lovely vegetable crop you have there :) Most of our garden is lawn, shrubs, flowers and several wild areas for hedgehogs and birds etc. Its not a huge plot but we get it all in somehow!! I have grown veggies in pots and herbs in a large planter and now have 3 raised beds that I will be starting next year to grow many more vegetables ! Really looking forward to it.I enjoyed your page, thankyou. I enjoyed reading your article. My garden this year was great but i don't have raised beds. We are thinking it would be a better idea when these plants finish to do some raised beds for soem Winter and Early Spring planting. this will give us the advantage of the plastic canopy/tent for protection. I was growing peppers, tomatoes and some herbs on the balcony and it was nice and relaxing experience. Now my timetable doesn't allow me anything like that but i hope in a year or two I could repeat and even expand some of my micro gardening experiments. I've already planted and harvested fresh greens from my small raised bed kitchen garden this spring 2012. I look forward to having a garden next year and I need to build a raised one - actually two, for the front flower gardens. I hope I can manage. I think most gardeners have a man to help with the building part. You sure got a nice crop of veggies! I live in a very small space (an apartment of less than 200 square feet) and tend to raise just one plant at a time -- an herb. I could do more, though, as you bring up. I have thought about it. I have also thought about writing about writing about what to raise in really small indoor sorts of spaces. Right now my garden consists of herbs, peppers, and tomatoes in pots -- and a couple watermelon and squash plants stuck in bare spots here and there! My soil is great, and I do plan to make a real garden. Enjoyed hearing and seeing how you made your garden. My garden is not small but it is laid out mainly to lawn, patio and flower beds. However, I do have a small greenhouse and I do keep joking with my hubby that we should turn the front garden into a vegetable and fruit garden - not sure what the neighbours would have to say about it though! July 1st update: we have tiny green tomatoes on our Roma tomato plants! Great idea. We've used raised bed gardens for years. Our first raised bed garden grew and grew until it became 50 sq m (that's a lot of imported topsoil) but necessary on our high clay soil land.